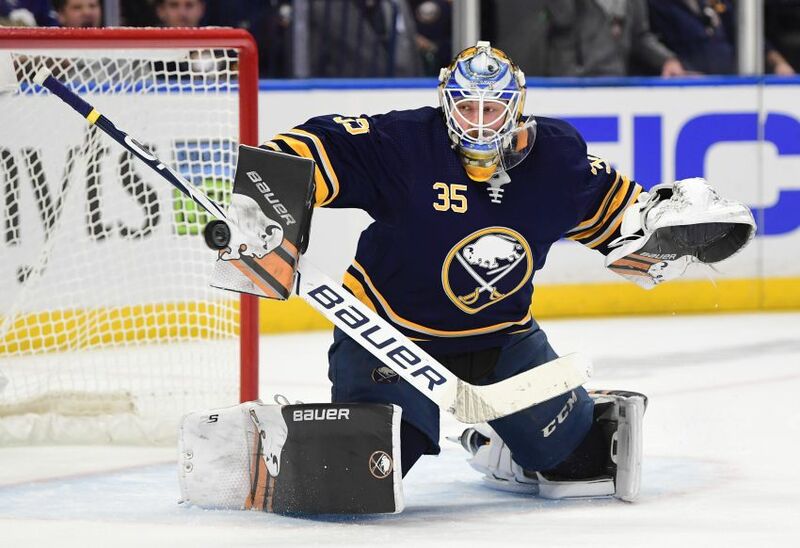 BUFFALO – In the last month or so, Sabres goalie Linus Ullmark has regularly earned starts over Carter Hutton. Instead of simply playing the second game of a back-to-back set, Sabres coach Phil Housley has utilized Ullmark eight times in the last 11 contests. Two of those appearances, including the final 20 minutes of Friday’s ugly 7-3 loss to the Chicago Blackhawks, came in relief of the struggling Hutton. Ullmark, 25, will start again tonight against the Minnesota Wild, his fourth nod in the last six contests. If the Swede keeps performing well, he could become the Sabres No. 1 goalie, a job many believed he would ascend to someday. “There’s no question in my mind Linus has played solid for us,” Housley said this morning inside KeyBank Center. “He’s given us an opportunity to win. You look at the game against Calgary (Jan. 16) with the saves he was making and that’s a great statement to make. Overall, Ullmark is 20-5-3 with a 2.89 goals-against average, a .914 save percentage and two shutouts in 21 games. He stopped 36 shots in Wednesday’s 1-0 road loss to the Dallas Stars. Ullmark made 37 saves in the Sabres’ 3-2 win Nov. 17 in Minnesota. – The Sabres will showcase the new lines, defense pairs and power play units they debuted Monday. For the first time in months, captain Jack Eichel will center a line without 31-goal Jeff Skinner. – The Sabres are 2-8-1 lifetime against the Wild at home. Minnesota has five straight games in Buffalo. Conversely, the Sabres are 8-4-0 in Minnesota since the Wild joined the NHL in 2000. Ulmark looked composed and focused throughout tonight’s game despite heavy pressure at times from the Wild! Sabres weren’t winning a lot of battles along the boards against the bigger Wild! Need to do better in this regard and clearing the front of the net! Quicker decisions passing and using sticks to poke check pucks along boards and center ice!